You love grilling in the summertime. You love sipping sangria while grilling. Why not combine both into one incredible beverage that will be deemed the best on the block? In this recipe, orange, pineapple, strawberries, and watermelon slices are threaded on a skewer and grilled to caramelize the natural fruit sugars and add layers of flavor to the drink. Combine the fruit with some boozy wine and top it off with a bubbly, sparkly rose. Voila! You've got yourself a new favorite classic that's worth putting on replay over and over again! Substitute your favorite seasonal fruit in this recipe. Try different varieties of melon, like cantaloupe and honey dew. 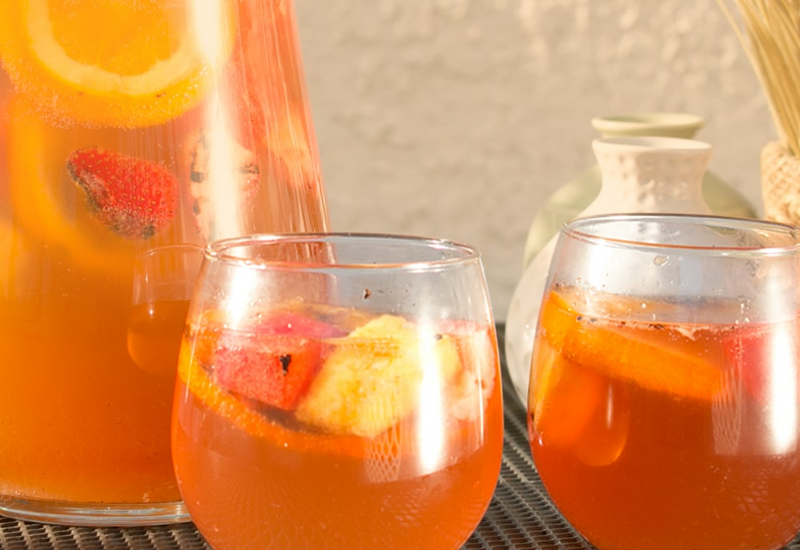 You can make springtime sangria or even fall fruit sangria. Roasted pears and apples with a sprinkling of cinnamon would be a great fall sangria! Add a few chile peppers to kick things up a notch! Sparkling white wine can be used in place of the rosé. Per Serving: 407 calories; 1g fat; 62.9g carbohydrates; 5g protein; 0mg cholesterol; 18mg sodium. Summer is almost over, but that only means I need to get my drink on! The best part about making sangria is the fruit soaking up all of that wine and brandy for hours. The party can begin (if it already hasn't) once you bring this refreshing beverage out. The fruit being grilled brings out this extra depth of flavor that only adds to the fruity punch. I changed this up and added 2 cups of light rum and we got a bit more than tipsy. It's a bit too much sangria for two people on a school night, but it kept well in the fridge for two days after until we were done. If you ask me, sangria is perfect for any time of year. I added a little club soda, and it was perfection. I also subbed watermelon for cantaloupe and honey dew (not grilled). It was really delicious! I used grilled grapes, oranges, lemons, and apples for my cocktail party. I let mine sit in the fridge for about 8 hours and it was perfect. We definitely had a good time, and everyone was really feeling it by the end of the night! This is definitely my go-to recipe.